Mugwort, also called St. John's Plant, Felon Herb and Common Wormwood, is a member of the daisy family that is distributed throughout Europe, Asia, Africa and North America. 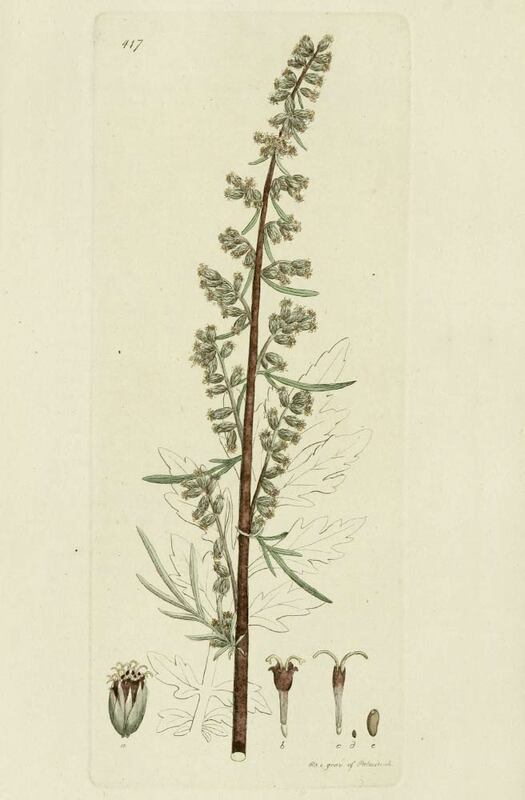 Prior to the use of hops as material for fermentation, mugwort was commonly used in beer-making, often in combination with other herbs and flowers. Now, as then, dried mugwort is almost always preferred to fresh, and is harvested when the plant is in flower to ensure peak potency. 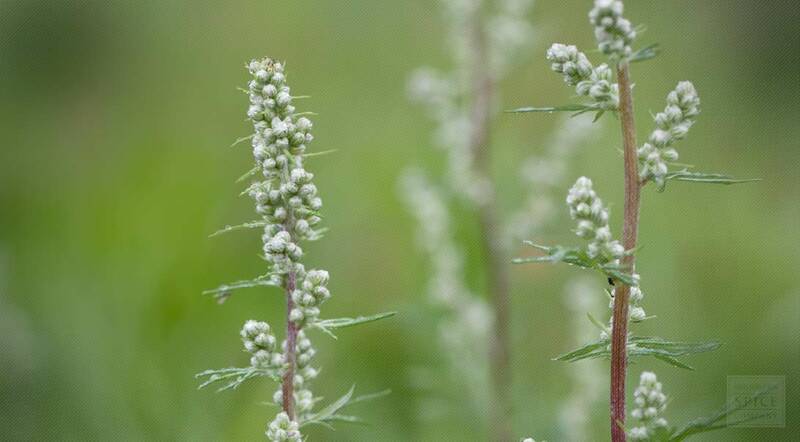 Today, mugwort is most commonly added to herbal tea blends and used to make ointments, salves and tinctures. The herb is also reputed to repel moths. Artemisia vulgaris is a tall herbaceous perennial plant of the Asteraceae family that grows 1–2 m tall—although on rare occasion it can reach heights of 2.5 m. It has a woody root. The leaves are 5–20 cm long, dark green, pinnate, with dense white tomentose hairs on the underside. The erect stem of the plant is often tinged red-purplish. The plant's small flowers (5 mm long) are radially symmetrical with many yellow or dark red petals. The narrow and numerous capitula (flower heads) spread out in racemose panicles. It flowers from July to September. The common name of mugwort is mistakenly thought to be derived from the plant's traditional use in flavoring drinks—a function mugwort had been performing for hundreds of years. These drinks were then imbibed from "mugs", hence the connection. More likely it was derived from muggi, the old Norse word for "marsh". Wort is from the old English word wyrt a general term for "root", "herb", or "plant". Artemisia vulgaris is native to temperate Europe, Asia, northern Africa and Alaska and is naturalized in North America. Grows in weedy and uncultivated areas, such as waste places and roadsides in full to part sun. Mugwort is considered to be an invasive weed in many areas. Prefers a well-drained slightly alkaline, moist loamy soil. Surface sow seeds from late winter to early summer in a greenhouse and do not allow the compost to dry out. When large enough to handle, transplant the seedlings into individual pots. If growth is sufficient, they can be planted out into their permanent positions in the summer, otherwise grow them on in a cold frame for their first winter and then plant them out in the spring. Can take divisions in spring or autumn or do basal cuttings in late spring. Harvest the young shoots when about 10 - 15cm long, pot up in a lightly shaded position in a greenhouse or cold frame and plant them out when well rooted. Collect the root in autumn. Wash and dry mugwort root thoroughly and lay it on a screen to dry. Take care in spacing the roots, if still-drying roots touch one another they may mold. Store dried mugwort in an airtight container in a cool, dry place.